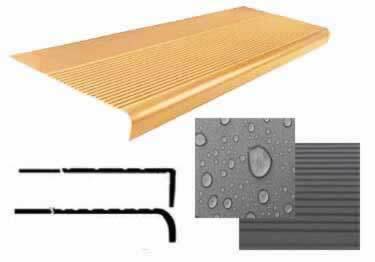 Roppe Grease Resistant Rib is a perfect solution for slippery wet greasy areas common in factories and restaurants. Rubber stair treads designed for interior installations including panfilled concrete and wood steps. Featuring a horizontal rib pattern. 1/8" thick at front tapering to.080"
Can the back of the tread be trimmed? I have a 11.5" depth step, and would need to trim this to fit perfect. I am assuming I can trim w/ a utility knife and straight edge? Thank you! A complete line of non slip Rubber Stair Treads manufactured by Roppe to repeal grease and oil.Avaialble in 70 colors and with or without abrasive strips. We couldn't be more pleased with our experience with Koffler....I found them on a google search, engaged in a chat with a representative who handled my questions perfectly.....I was given an discount when I made the purchase and the gent followed up afterwards to make sure the discount was applied.....then the Roppe product arrived and it couldn't have 'fit the bill' better. Thank you for your review. We greatly appreciate the kind words about our customer service and delivery. We work very hard to excel in these areas and we're so pleased that our efforts are paying off. I found the product to be the quality I expected, and I am pleased with the appearance. Trimming was easy and I used a rubber base adhesive to glue it the wood stair tread. While this may be pricier than what you may get in a Lowes or Home Depot, I am convinced the life of the product greatly makes up for the cost. I was able to find a product that is not readily available to the general public(home depot, Lowe's). Provides underfoot comfort, reduced noise&slip resistant characteristics. Enough for any heavy traffic area.